Now You’re Playing with Portable Power! Ultimate NES Remix brings the finest bits from the NES Remix and NES Remix 2 games to the hand-held Nintendo 3DS system for the first time. Take on a rapid-fire onslaught of challenges from 16 of Nintendo’s most memorable NES games, including Super Mario Bros. 3, The Legend of Zelda, Metroid and Kid Icarus. Use Princess Peach to rescue Princess Peach. Fight a Hammer Bro with Link from Zelda II: The Adventure of Link. Collect gold coins as Samus Aran. 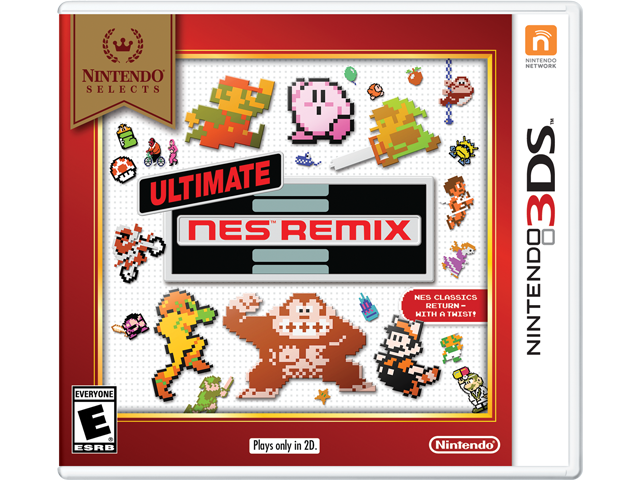 The Ultimate NES Remix game lets you experience some of the wildest NES mashups. In the exclusive Speed Mario Bros., play through the original Super Mario Bros., but with everything ramped up to super speed! The new Famicom Remix Mode offers challenges from the Japanese version of NES Remix, featuring slightly different sound effects and backgrounds.